Vintage design has taken a prominent place in our everyday lives. The all-time favorites are popular in homes, restaurants and other public places. They live up the background of any photo shoot or shopping window. To top it off, several designs have found their way to movie stardom! We have summarized some of the most striking appearances of vintage design in the movies. Maybe your favorite movie has been closer to your everyday life than you thought! Let’s start with one of the most recognized objects of the last century: the Barcelona Chair. Even if you have little interest in vintage design, this beauty must seem familiar. Mies van der Rohe designed the chair and everything about it breathes his philosophy: “less is more”. Originaly produced in Germany for the World Exhibition in Barcelona, Spain. The production rights where given to Knoll International in 1948. They added some more foam to the seat to maximize seating comfort. It was inspired by old Roman seats, combined with contemporary materials. All the way from the Romans, the chairs made their way to the alternate universe of TRON: LEGACY (2010). 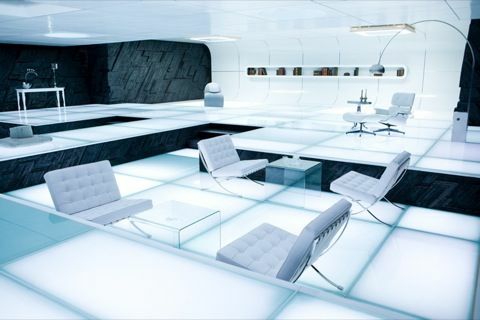 The white upholstery that was used gives them a futuristic style! As you might notice, they are not the only pieces of vintage design in this decor. Also, this is not the only decor showcasing the Barcelonas! The black leather version deserves to be mentioned as well. It has a very luxurious appearance. so of course it’s a perfect fit for the one and only Mr. James Bond (by Daniel Craig) in Casino Royale (2006). One of the most iconic and sought after high-end pieces of Swiss design. The DS-600 sofa was originaly named after the myhtical alpine creature: Tatzelwurm (in short: a giant snake with a cat’s head). Call it mythical, this sofa definitely has an impressive appearance! Manufacturer De Sede famously combines unique designs with practical use. The modular elements of this sofa can be expanded to suit every individual taste. The luxurious, almost futuristic style of this piece did not remain unnoticed. It has traveled the world and even found its place in the Guinness Book of Records as the world’s longest sofa. It even found it’s way to The Capitol in The Hunger Games (2012). Moreover, the sofa had a role in the more recent movie Black Mirror: Bandersnatch (2018) on Netflix. It’s obvious that this midcentury piece is a timeless design: director’s seem to love using it to represent a futuristic style to the decor! The Tulip series (dining chairs and table) might be the most iconic design by Eero Saarinen. He aimed to resulve the “ugly, confusing, unrestful world” underneath tables and chairs. As a result: a collection of smooth shapes and a defining accomplishment of modern design. 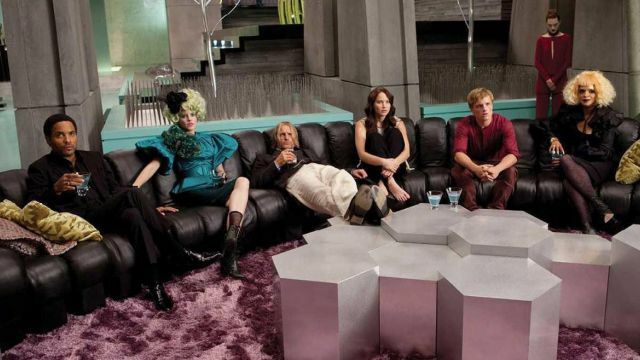 The unique style of these chairs has been noticed by interior designers and movie producers worldwide. They have a prominent role in one of the biggest movie and tv franchises of all time: Star Trek. 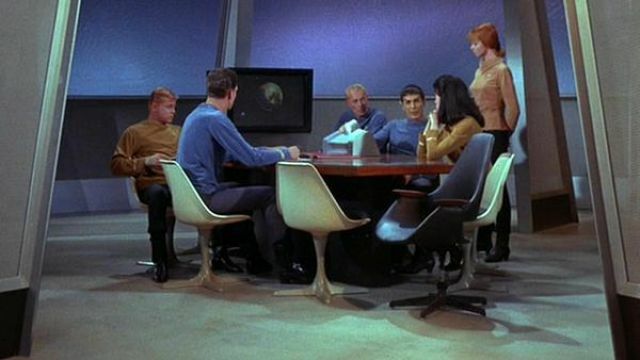 Below a shot from the series Star Trek (1966-1969), showing how the chairs fit seamlessly even in a futuristic decor like this one! However, there are different variations on this chair. So they are perfectly suitable for different decors. This could definitely be considered otherworldly design! We love seeing how vintage design has an impact on every aspect of society! They are not only living up our interiors, above all they are also a big part of our culture. It’s amazing how pieces that were designed years ago, are still being used today and in movies often represent a futuristic setting! Are you interested in learning more about design in the movies, and see the pieces in real life: the exhibition “All in the Movies” is on at Galerie Gaudium at the time of writing.